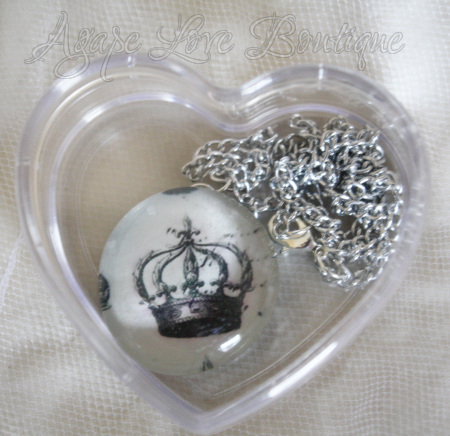 Agape Love Designs: Vintage Crown Glass Pendant Giveaway! Today I am giving away one of my very own creations! then you saw the new glass pendants I have in my shop. like I am wearing here! Do you think you want to win one of these?? Yay I hoped you would! There are several ways you can win! Leave a seperate comment for each entry! Leave me a comment saying you are. 2.) 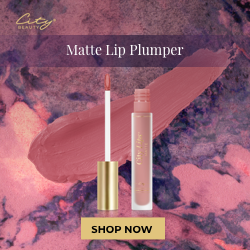 Tell me what your Favorite item is in my shop. yourself wearing the necklace on my FB wall? leave me a comment letting me know that you would! 6.) Visit & Follow my Sponsors! know that Maria from Agape Love Designs sent you!! This is good for 5 extra entries! 7.) Blog, FB or Twitter about this giveaway! with a leave a link! This is good for 3 extra entries! I would totally post a picture! I am a follower!!! I LOVE this pendant you are giving away. I LOVE this pendant you are giving away. I'm a public follower! My username is Radioactive Bride! Green & Pink Fleur De Lis Glass Pendant Necklace! 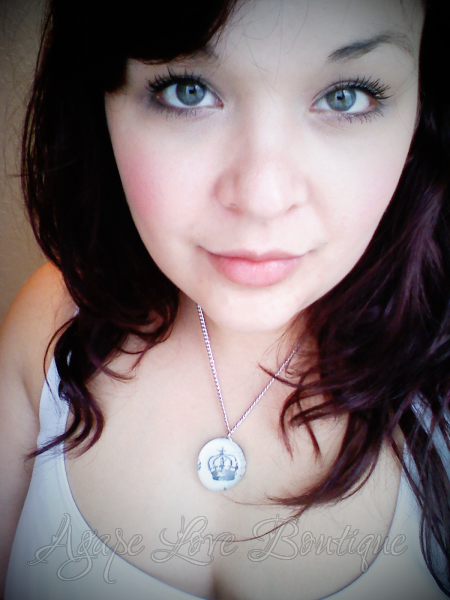 I would absolutely post a picture on FB of me and the darling necklace! These new necklaces are now my favorite item in your shop. 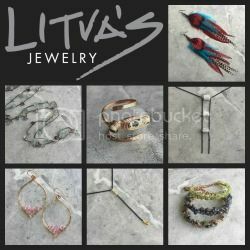 Your boutique is one of my ETSY favorites! I would soooooo post a pic wearing the necklace and my Facebook. I'll most likely blog about it too. I'm a follower! :) Love it!!!!!!!!!! I would totally post a pic of me wearing this necklace! You know darn well I follow you! I NEED, yes NEED, that peacock necklace. It will match my tattoo! Yes I would post a pic on FB. Everyone loves fan photos! P.S. I forgot on my previous two posts, FB name is Stephanie McDonnell and Etsy is Luxe Boulevard. My bad! Of course I follow Luxe Boulevard. It would be silly of my not to. LOL! I already follow Bella Before and After. I sponsor her too. She rocks! Just followed Mommy Made. Golly, that girl of hers is stunning! And last but not least, following Diary of a Craftaholic. I loved seeing all the books on her blog! Just FB'd the giveaway. I hope it all rolls in for you! I'm a new follower! I can't wait to see what else you have! I would totally post a wall photo on FB wearing the necklace! I love all your items but I would have to say my favorite is the Black and Pink Damask Fabric Accessory Set! I heart on Etsy! My username is kaylynn_0419(at)yahoo(dot)com same as my email address! I would totally post a picture of me wearing it on your facebook wall! This necklace is so darn cute! I am following Art by Jacy! I am a new follower of Luxe Boulevard! I am a new follower of Bella Before and After! I am a new follower of Diary of A Craftaholic! Alrighty girl, here goes my entries, he he. Now I know where all those new followers were coming from, you are AWESOME girl, I was totally wondering, hmmm, what is Maria doing exactly getting people to come over to my blog, and follow like that, he he. I follow you on your blog!!! Im totally digging your new peacock necklace girl, it's beautiful!!! 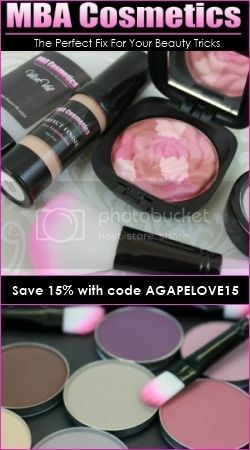 I follow Agape Love on Facebook!! I heart Agape Love design on Etsy!! I would love to post a pic of my winning necklace, and still need to post some of the other goodies, I've gotten from you girl. I follow my girl, STeph at Luxe Blvd, and love her!! 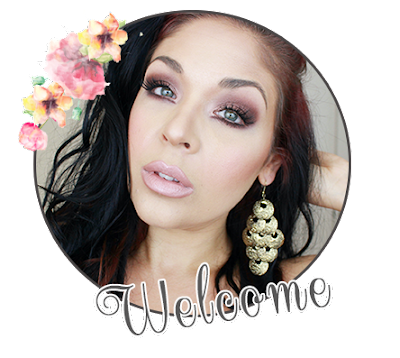 I've added this to my Giveaway section on my right sidebar!! I just posted on Facebook about it too. Following Art by Jacy now, She's very talented girl, her art is awesome. I follow Diary of a Craftaholic now too. Great blog!! I follow Mommy Made, and LOVE all those pics you took of your BEAUTIFUL daughter. Seriously she is stunning, and her dimples, and eyes, are out of this world beautiful!!! I favorited your Etsy shop! I'm Cotton Breeze. I like you on Facebook (my name is Marisa Jesus). I favorited your Etsy shop (my name is IsaTheMChart).